My husband and I celebrated our 25th wedding anniversary last week, and boy did we celebrate! 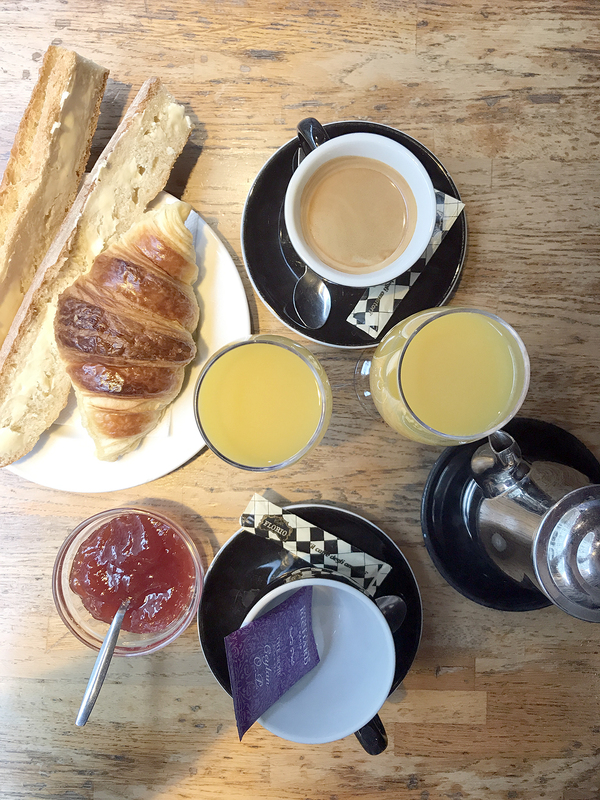 We spent the week in Paris exploring, sightseeing, shopping, and OF COURSE eating. 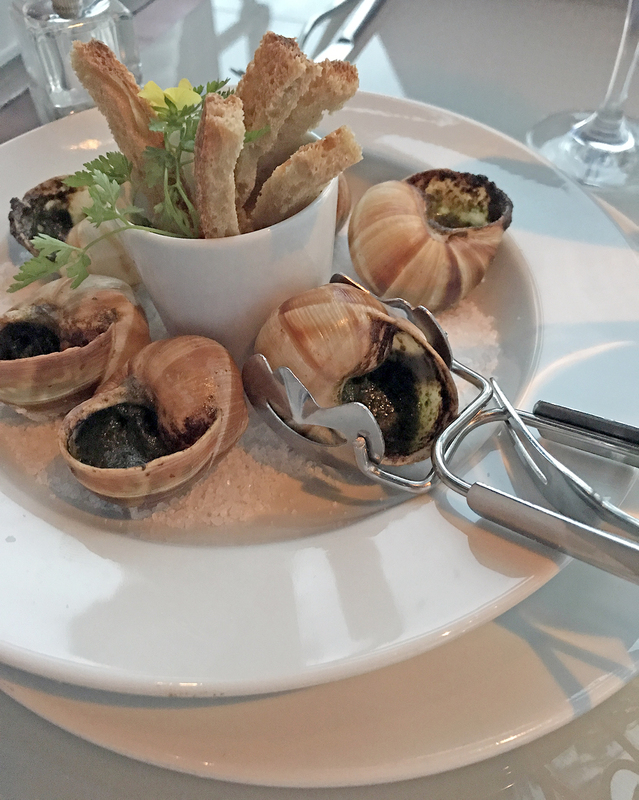 I had never tried escargots…so when my husband suggested that we order them, I assumed he had eaten them before. Well, no he had not! 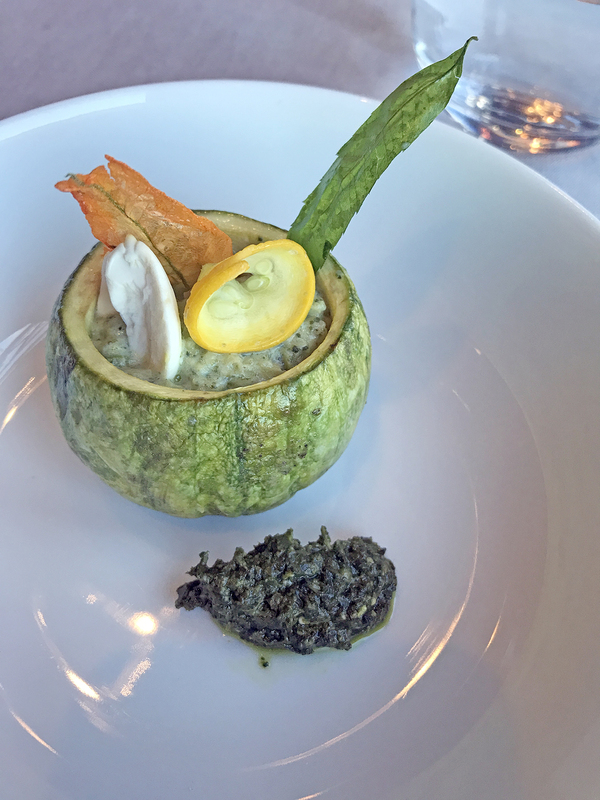 It was a comical scene when our waiter set them on the table and we just looked at each other with puzzled expressions on our faces. Thank goodness for iPhones and google…we quickly learned how easy it was to get to the snail. And so yummy! 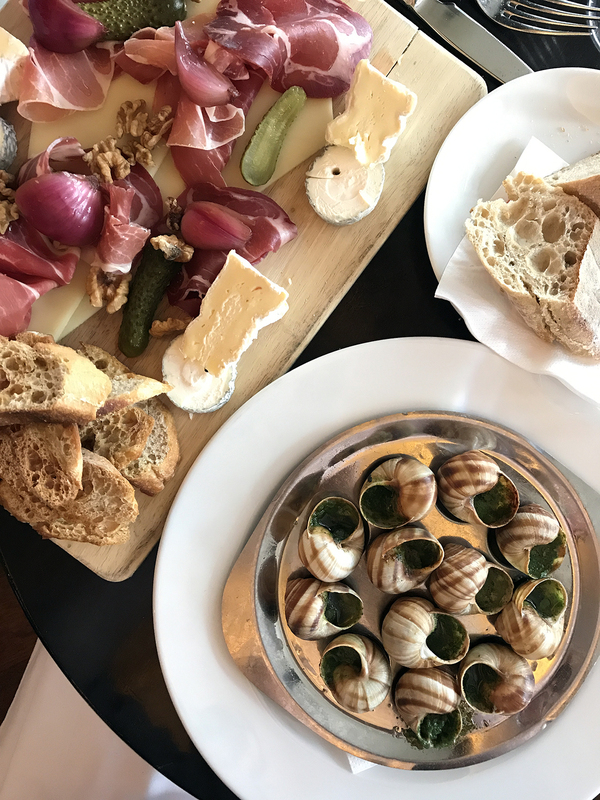 For the rest of the week, I searched the menu at every restaurant we visited for escargots…I didn’t want to leave Paris without having them again! Of course, we have croissants here in the States but there is something different about the ones in France. 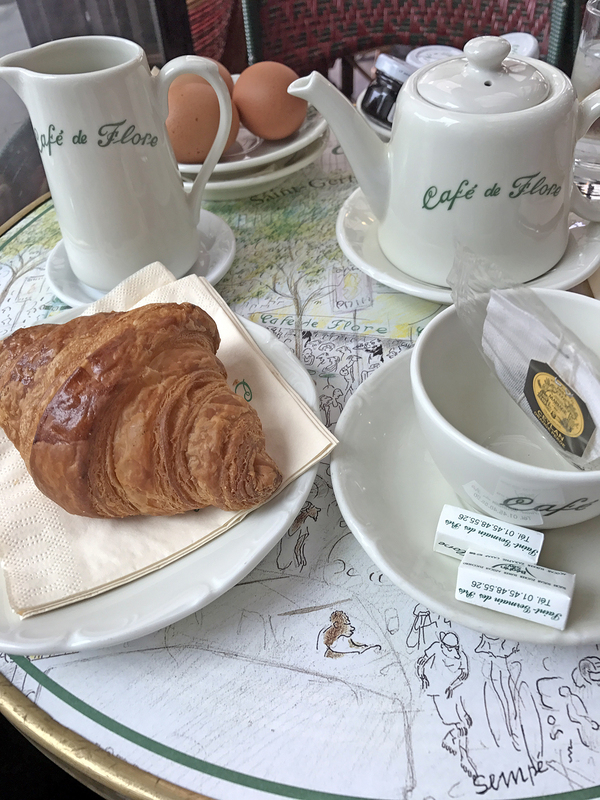 I resisted eating those buttery, flaky pastries the first few mornings…I’d rather have some protein in the morning. I soon realized I was missing out! Bring on the jam! 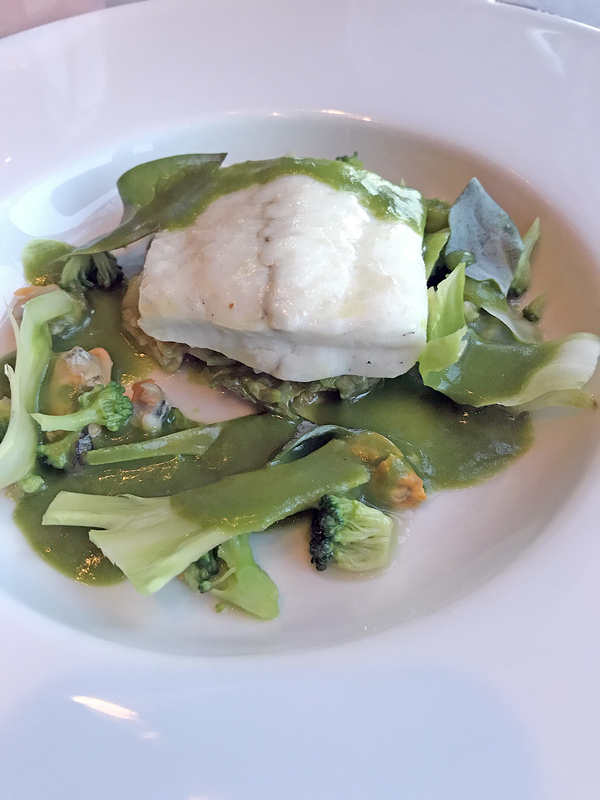 My friend, Julie, recommended the restaurant, Georges, to us. I’m so glad she did! 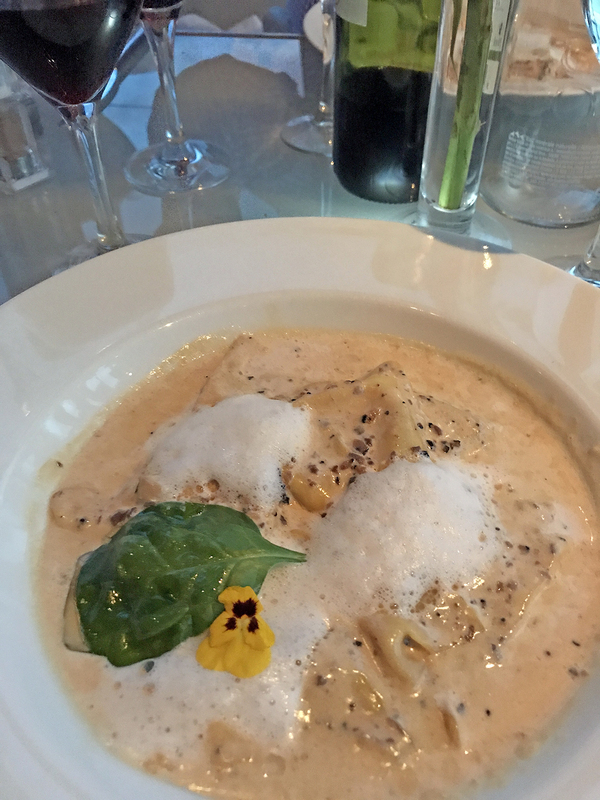 As if the breath-taking views of the city from atop the restaurant weren’t enough, this mushroom ravioli with truffle sauce definitely put Georges on our favorite list. 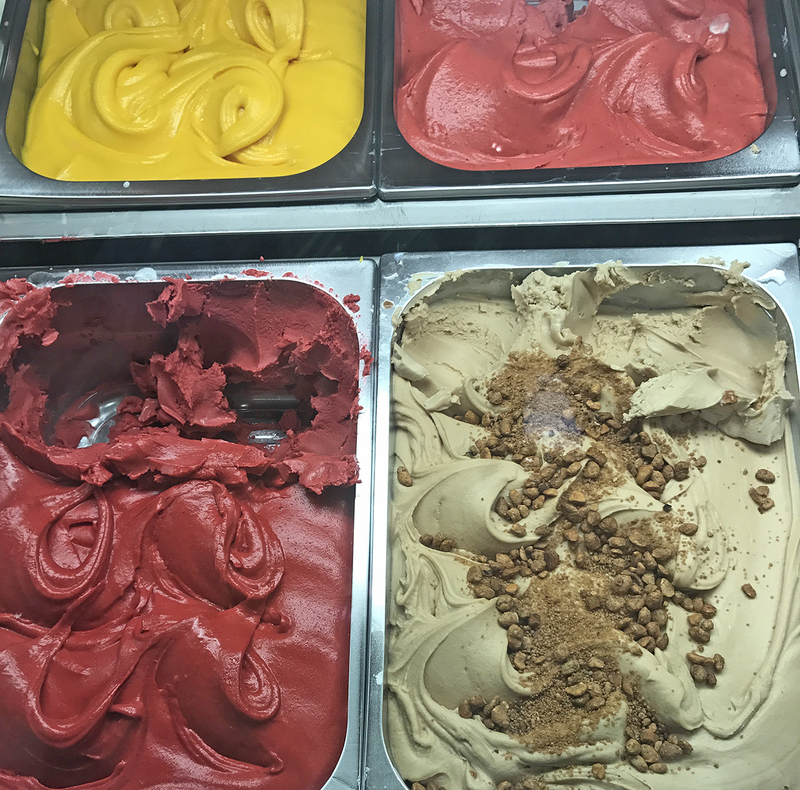 We visited Italy about six years ago, and gelato stands could be found on every street corner…so I assumed gelato was an Italian treat. 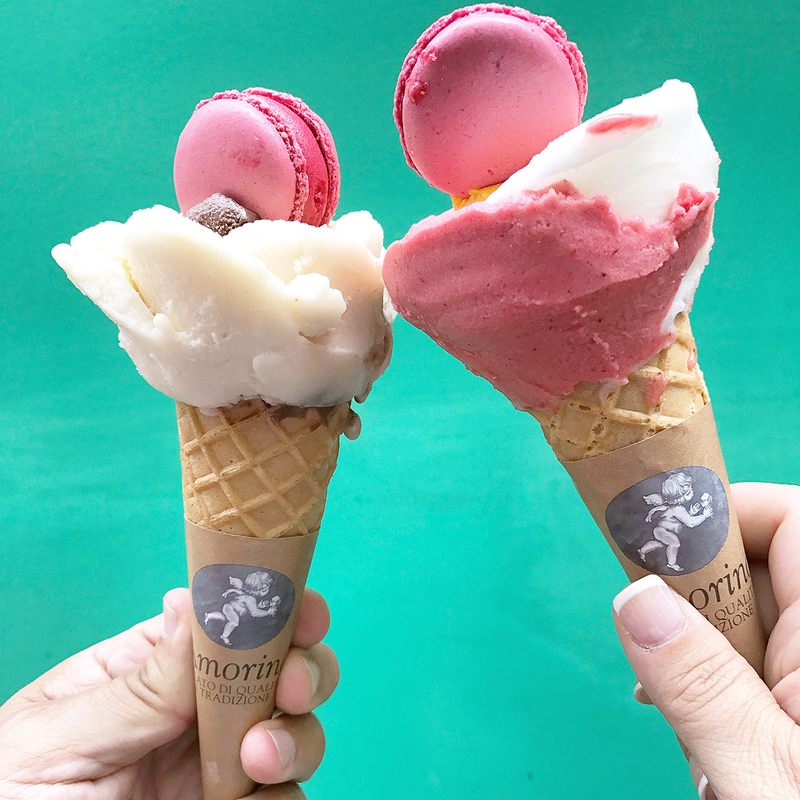 Well, gelato is just as popular and plentiful in Paris. 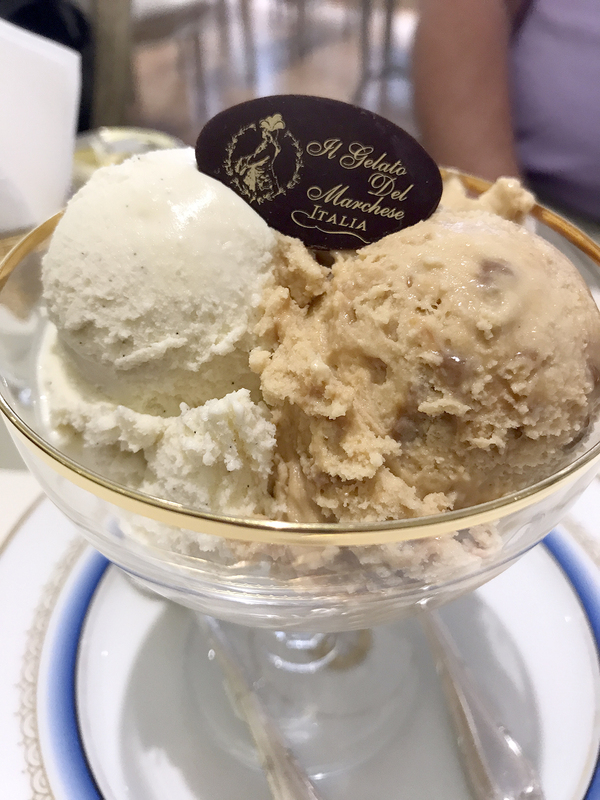 In addition to gelato stands, we found a beautiful gelato tea room, Il Gelato Del Marchese. It was such a cute place that I coerced my husband into going in for an afternoon snack. 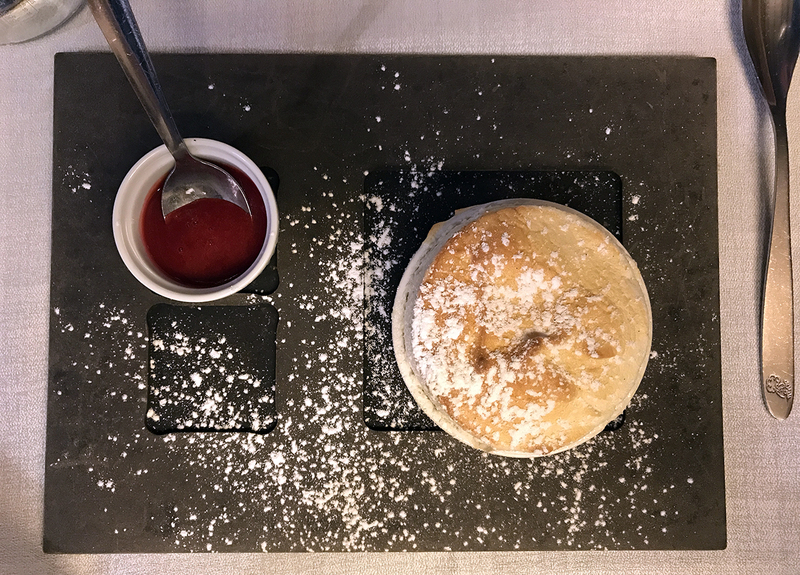 What a treat for the eyes…and the tastebuds! 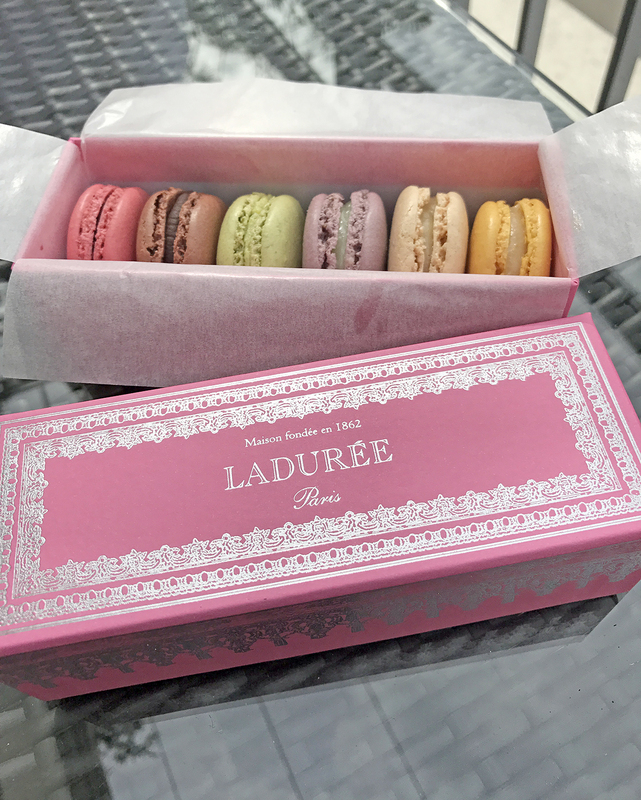 Speaking of macarons, a visit to Paris isn’t complete without sampling some! 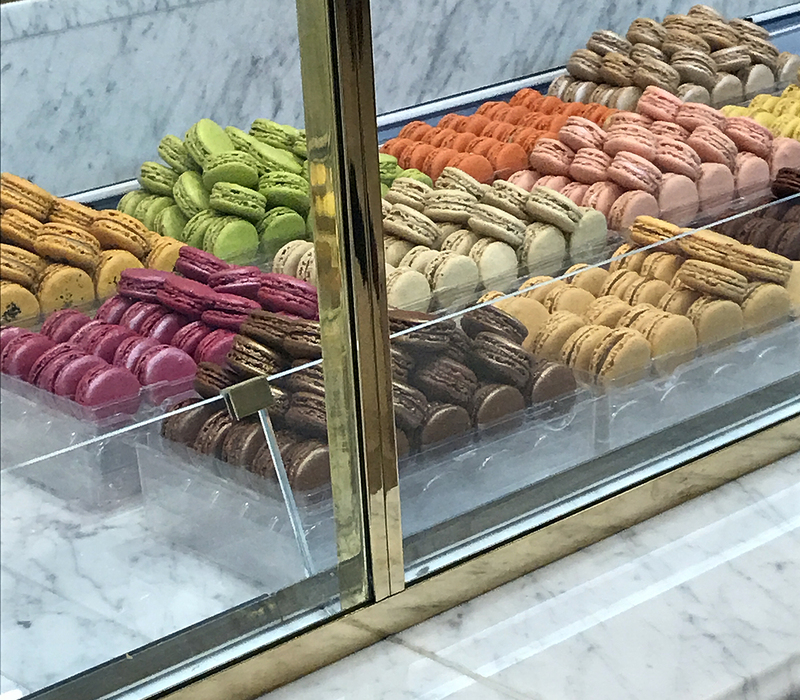 We loved our visits (yes, we made more than one) to Laduree…the macarons were so beautifully displayed and tasted soooo fresh. And so many flavors from which to choose! 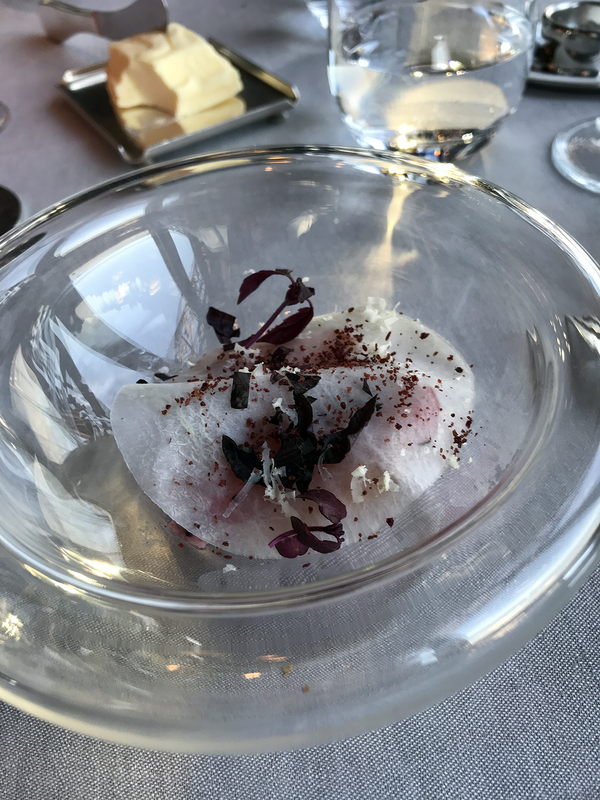 When I saw goat cheese listed as an ingredient on this salad, I immediately knew what I was ordering for dinner our first night in Paris. 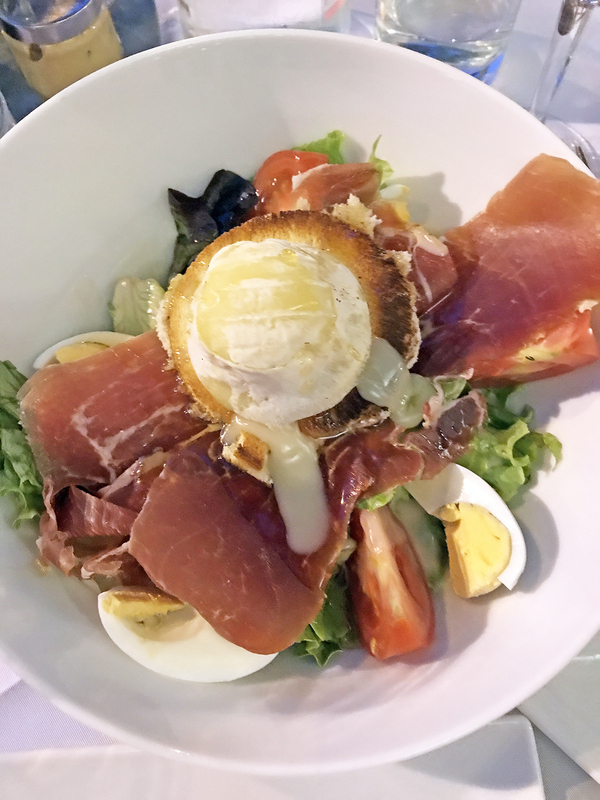 Hard boiled egg, ham, and honey, combined with goat cheese on mini toasts…the sweet and savory flavors were just delicious! 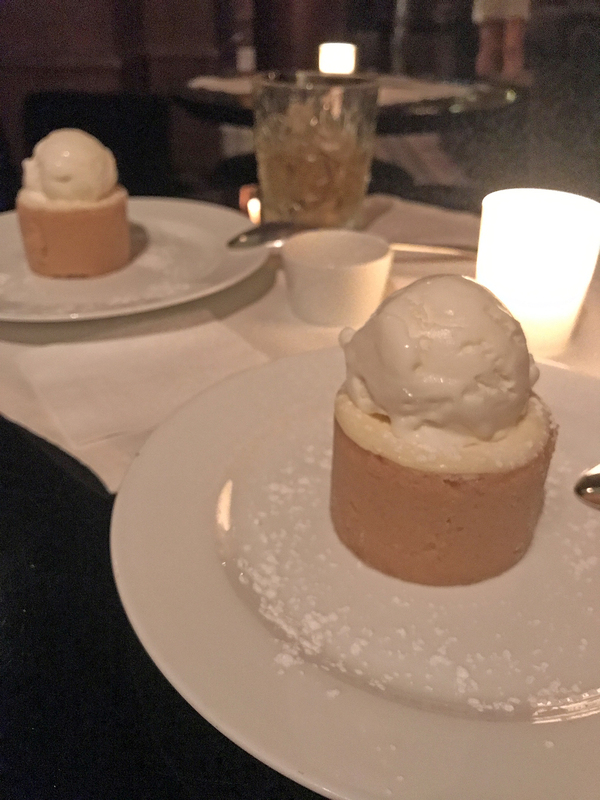 Prior to our trip, my friend, Carey, shared with me that Hotel Costes is a hotel bar/restaurant that Kim Kardashian visits for their cheesecake. 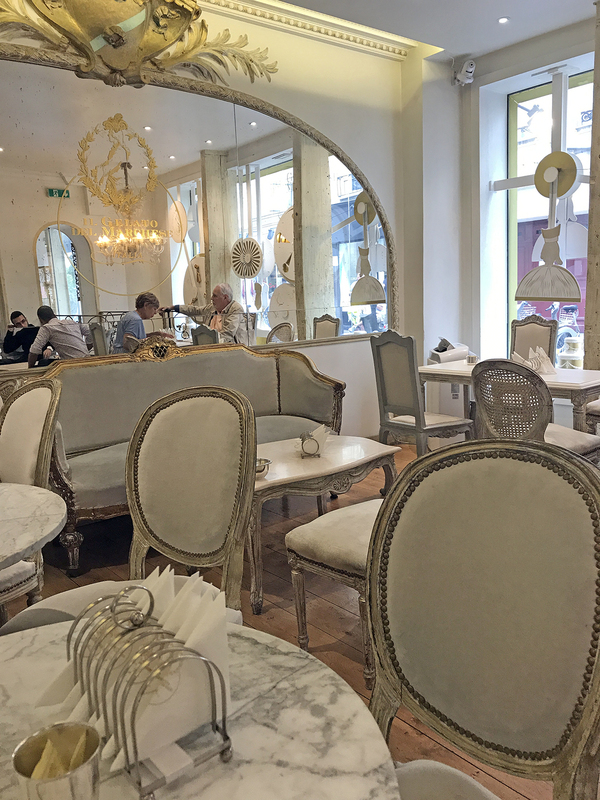 I was somewhat intrigued and did a little “google research.” Apparently, Kim admitted to flying all the way to Paris just for their cheesecake. 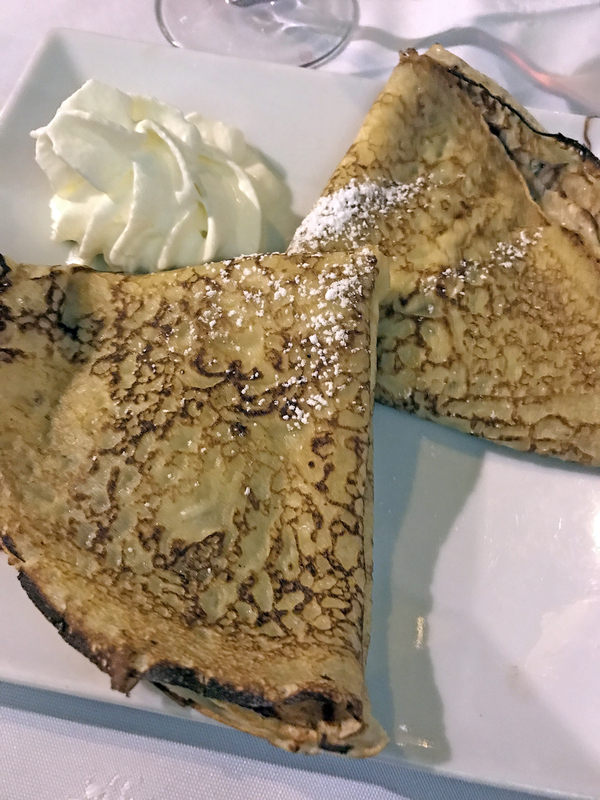 Well, I figured this cheesecake must be good…so I convinced my husband to go there late one evening after we saw a show at Moulin Rouge. Oh my goodness…I’ve never tasted cheesecake so good and creamy, and the crust was perfect! 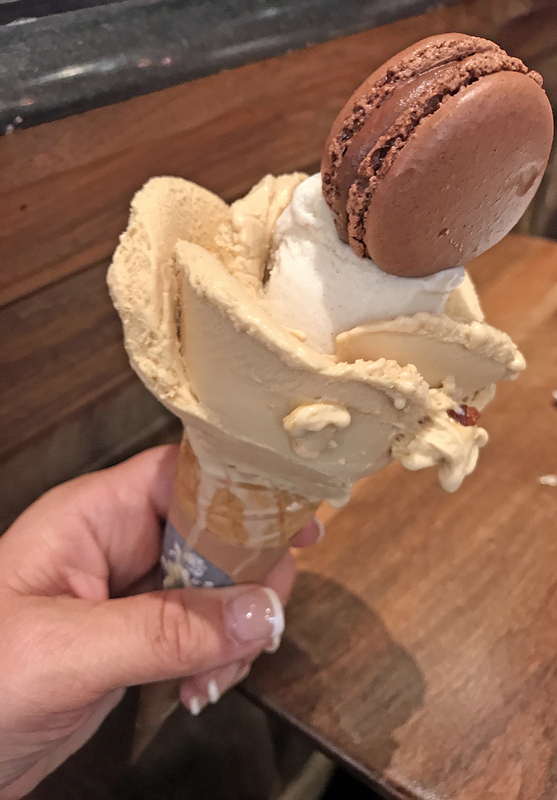 They even serve it with a scoop of French vanilla ice cream on top. 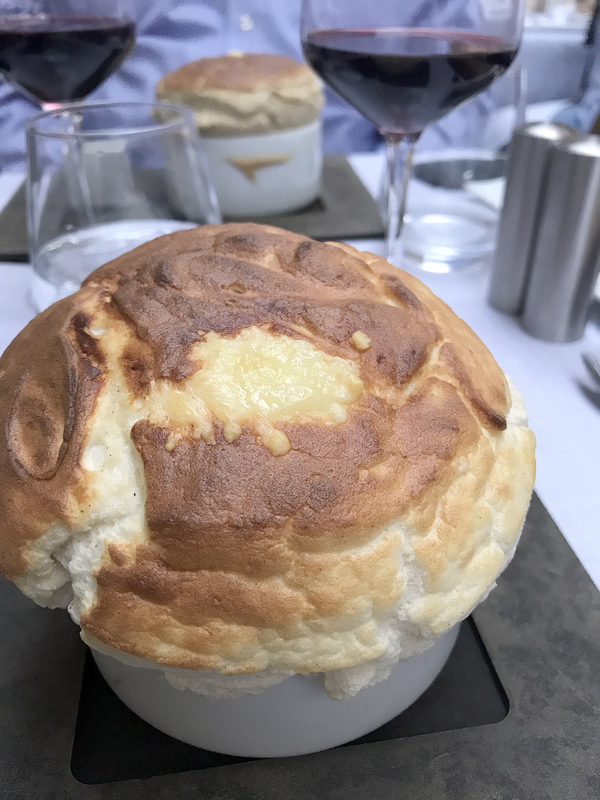 I’m not sure I would fly all the way to Paris for it, BUT if I’m ever in Paris again I will stop by Hotel Costes for some dessert! 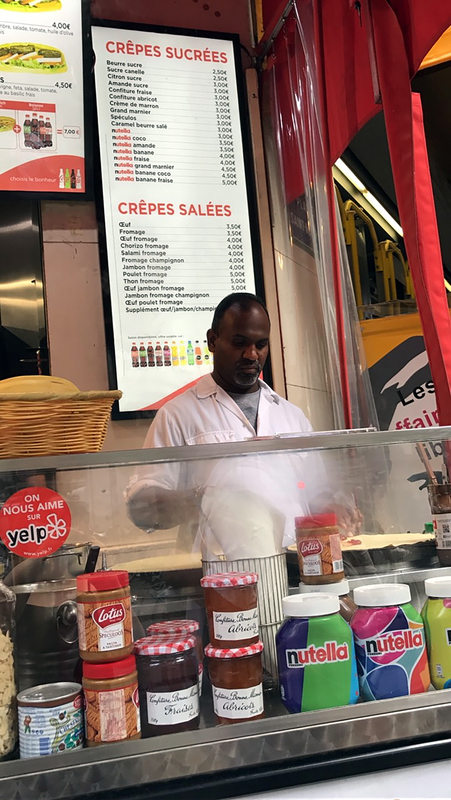 Just like gelato and macarons, you can’t walk down a street without finding a crepe stand. Nutella, jam, bananas…lots of ways to make them! And they eat them for breakfast and dessert, and everything in between!! Our last night in Paris, we ate dinner at Le Recamier. It happened quite by accident…we discovered the restaurant where we had reservations was closed when our taxi pulled down the street. 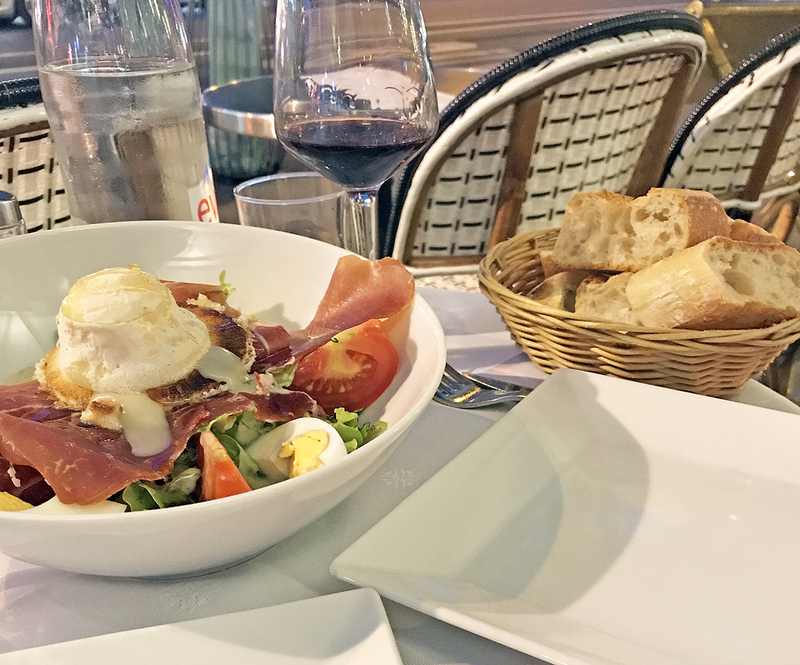 Our taxi driver was so kind…he called the owner of Le ReCamier and arranged for us to have a table at his place. He personally escorted us there and introduced us to the owner/ chef. 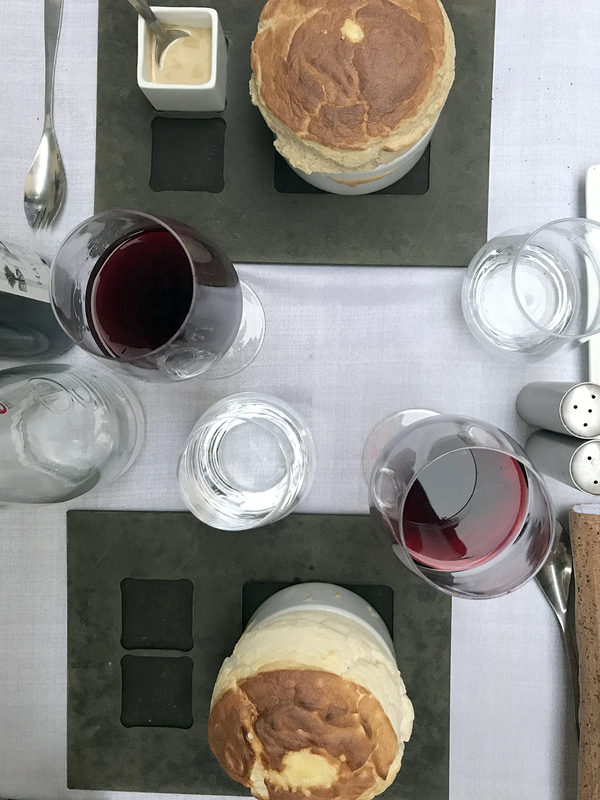 The menu had a few selections of souffles, and we thought it seemed like such a French thing to eat. So cheese for me and mushroom for Phillip! 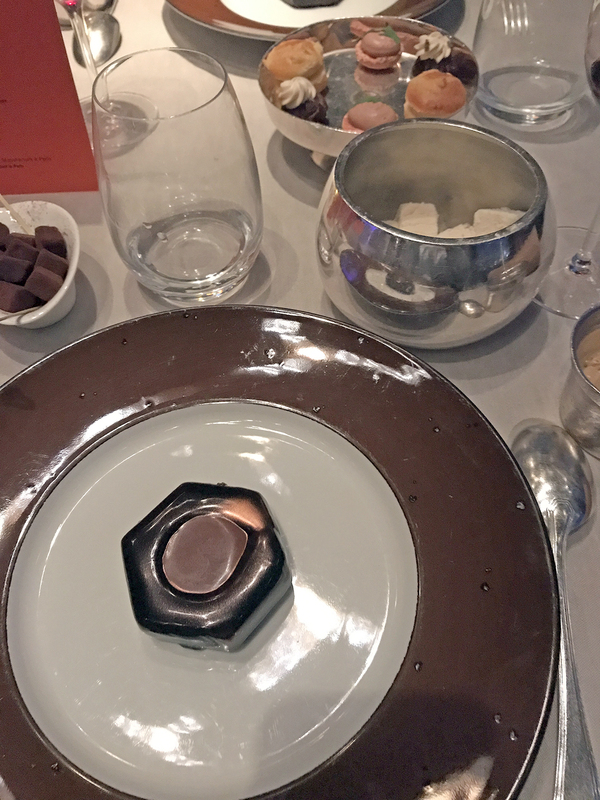 Of course, there were dessert souffles…chocolate, vanilla, raspberry. It was such a great dinner, and I’m so thankful to our taxi driver for “saving” us that evening. 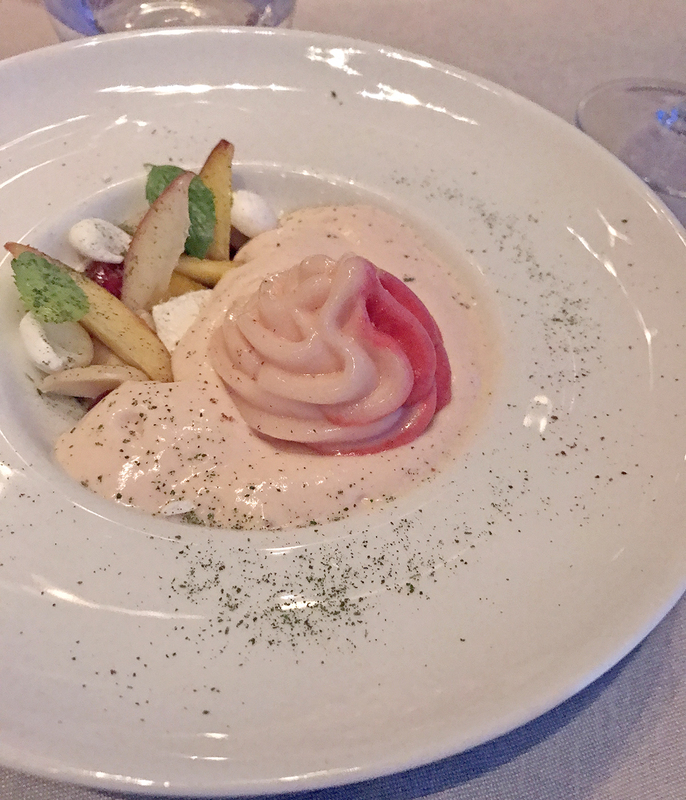 Finally, my absolute favorite dining experience was the night of our anniversary! 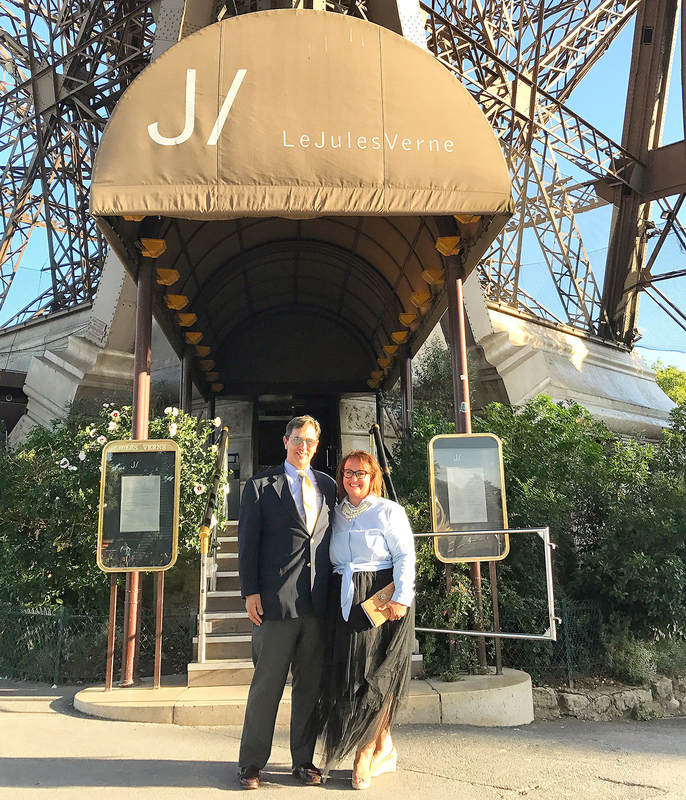 My husband planned this months ago and we celebrated with a dinner at Le Jules Verne, the restaurant in the Eiffel Tower. 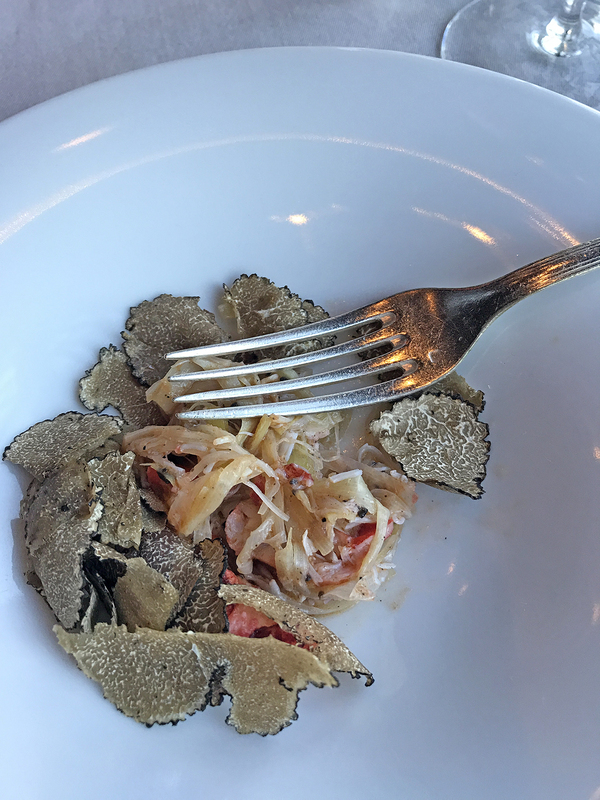 I can’t even begin to tell you how magical it was…the nighttime views of the city, the twinkling lights on the Eiffel Tower, the superior service of the wait staff, and the six course dinner. A night I won’t ever forget! 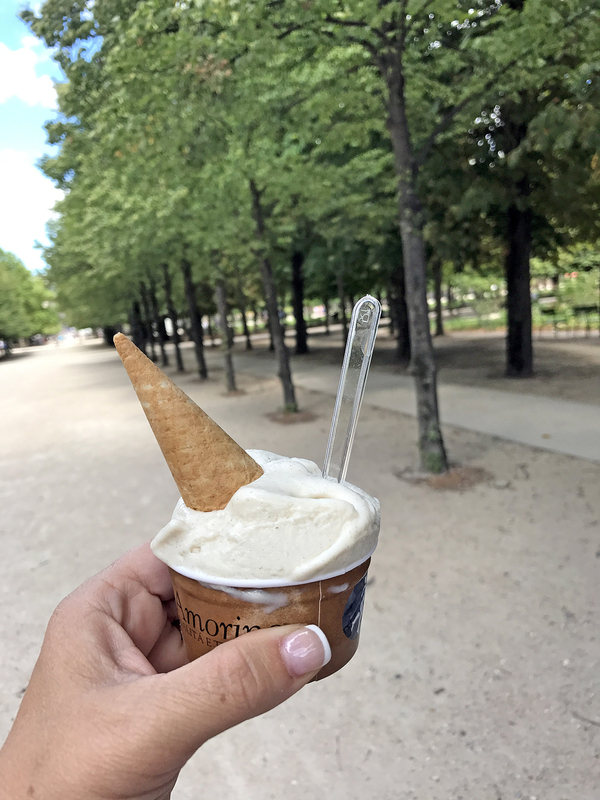 We definitely enjoyed trying some new foods while in Paris…it’s a good thing that we walked on average seven miles a day while on our trip!! !